We invite you to contact us today to discuss your care. Please don't hesitate to contact us today! Comprehensive Eye Exams, Glaucoma Testing, LASIK Referral and More! Welcome to Eye Care Of Virginia in King George and Culpeper. Dr. Miles Press and the Eye Care Of Virginia team are committed to providing our patients with professional optometry services. Our Culpeper optometrist provides comprehensive eye care services that go beyond basic vision exams. We can diagnose glaucoma, cataracts and macular degeneration; provide diabetic eye exams and color vision testing; and provide evaluations and referrals for patients interested in LASIK surgery. At Eye Care Of Virginia in King George and Culpeper, our eye care team looks at the big picture when it comes to your eye health. Getting the right prescription for your eyeglasses or contacts is important so you can see clearly while reading, driving a car, playing sports, and living an active life. Our routine eye examinations and contact lens fittings ensure your prescription provides the visual acuity and clear eyesight you need. If you currently wear glasses or prescription contacts, we recommend an annual eye exam to ensure your prescription is providing optimum vision correction. I recently needed to change my vision prescription and was finally in need of bifocals. I went to see Dr. Miles Press for both convenience (local eye doctor) and because he accepted my insurance. I needed to have vision in my right eye adjusted several times, and several right lenses replaced. Dr.Miles Press worked tirelessly to make sure my vision was correct and I was never charged for each subsequent visit or lens replacement. I've never had an eye doctor like that before, that really cares and is fast and on the ball with knowledge to get you the correct prescription. He also cared that I went with Progressive lenses over bifocals because they provide three fields of view and eliminate the annoying line. To sum it up, an eye doctor that treats you like he would his own family is a rare experience. I will continue to go to Dr. Miles Press as long as he is in business and accepts my insurance. No question. Dr. Miles Press was very professional, knowledgable, and friendly. He explained a lot about my eye care that no Dr. has every taken the time to do. Dr. 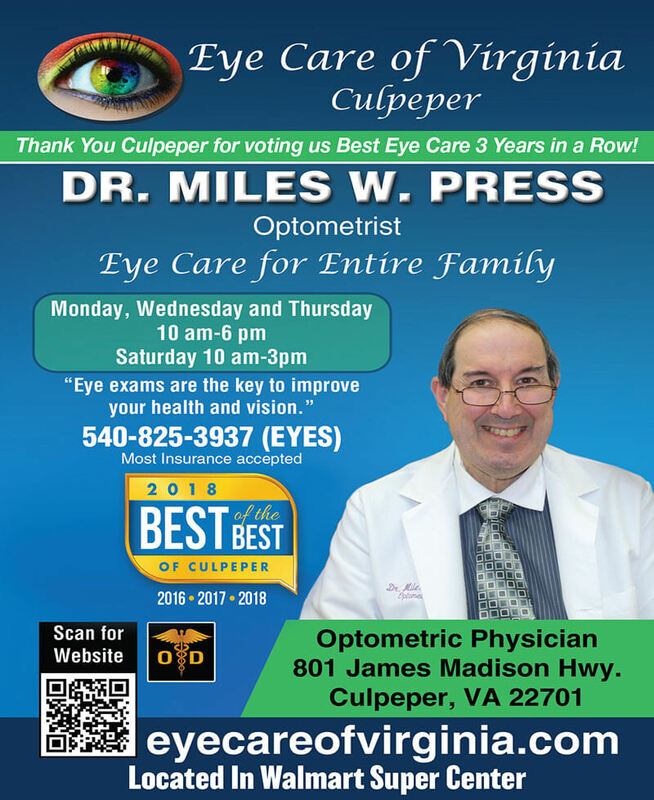 Miles Press and his Eye Care Of Virginia team consistently provide comprehensive, state-of-the-art vision services to families in the Culpeper and King George Virginia communities, and have been examining patients for 47 years. Eye care of Virginia is proud to provide the people of Culpeper and King George, Virginia with reliable eye exams and quality eye care. When you're considering coming into an Eye Care of Virginia location, you likely have questions about how the process will work, how payments are handled, and related things.